Hey guys, it’s Whatever Wednesdays again. A little while back I did a series of posts centered around Diamonds. However, this kind of got disrupted by the Match. Now that the Match is over, let’s try to get back on track. Given the interest in this particular cut type, and it being somewhat uncommon, I decided to do short blog post on what it is. What is an Old Mine Cut (OMC)? The most interesting thing about the Old Mine Cut is that they usually have a rich history. This diamond cut type was cut by hand from the early 1700s to the late 1800s and turn of the 19th century (spanning the Georgian and Victorian eras). While it has 58 facets like the more commonly known Round Brilliant, its shape is more squarish and is therefore distinctly different. It’s actually most similar to a cushion cut. Many consider the cushion cut to be a “modern take” on the old mine cut. Early diamond cutters (“bruters”) shaped this diamonds by grinding two diamonds together in order to create this shape. For this reason, for the most part any old mine cut diamond is essentially unique with significant variability in their dimensions. Why are they not very common anymore? Well, near the end of 1800s, the Round Brilliant Cut became more popular with the invention of the bruting machine in 1874. This provided more cutting precision and control. It was then that they discovered the a Round Brilliant Cut is the best way to maximize a diamonds sparkle. As such, old mine cuts became significantly less common. Wait, what is a European cut? A European cut is also called a “transitional cut” which encompasses this time period between old mine cuts and the solidification of the round brilliant cut standard. This time period is considered the early 1900s from ~1901-1915, known as the Edwardian period (Art Deco period). Therefore, an Old Mine Cut has a smaller table, larger culet, and higher crown compared to the Modern Round Brilliant. It also has short lower half facets and a girdle that is very thin in places. Are they cutting “new” diamonds into Old Mine Cuts? I didn’t know this until I researched it… but apparently yes. There are some that replicate an “old mine cut”. However, I’m not sure this is a correct designation. In my opinion, the whole point of an Old Mine Cut is that it was the hand cut diamond from the 1700-1900s. Taking a new diamond and cutting into an Old Mine Cut “style” with the current modern technology seems kind of weird to me. That said, I haven’t really looked into it all that much. Unfortunately, there aren’t any “perfect” dimensions you can choose in order to ensure the best possible Old Mine Cut (unlike the heavily studied Round Brilliant). The variability in all of the different dimensions makes it impossible to judge an old mine cut diamond sight unseen. In my opinion, if you are planning to buy an Old Mine Cut diamond, you will need to go through a reputable antique diamond seller. I’ve read some stories of people trying to sell synthetically made diamonds and passing them off as old mine cuts or old european cuts because antique jewelry usually won’t come with a certification. I would want to have a diamond expert look at any old mine cut I intended to purchase. Old Mine Cut diamonds deserve special mention because of their hand cut history. If you want a diamond from by-gone era with a rich history, Old Mine Cut should probably be at the top of your list. 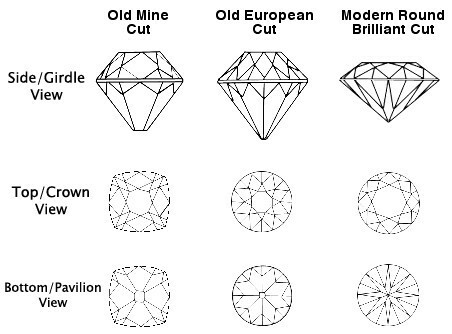 Old European Cuts are a transitional cut between Old Mine Cut and Modern Round Brilliants, described above. If you decide to buy an Old Mine Cut, I think you will need go through a reputable antique diamond seller as well as have a diamond expert you trust look at it. What do you think? Do you own or want to buy an Old Mine Cut?